Devious Maids, which premiered on Lifetime, June 23, features custom bedding and drapes sewn by Atlanta-based sewing shop, The Sewing Studio. The shop’s creations for the drama range from the very ornate gold drapes in the Powell’s study to the simple panels in Zoila’s house. The Sewing Studio’s work can be seen in rooms throughout the show, including the sheers and drapes in many of the characters’ homes. 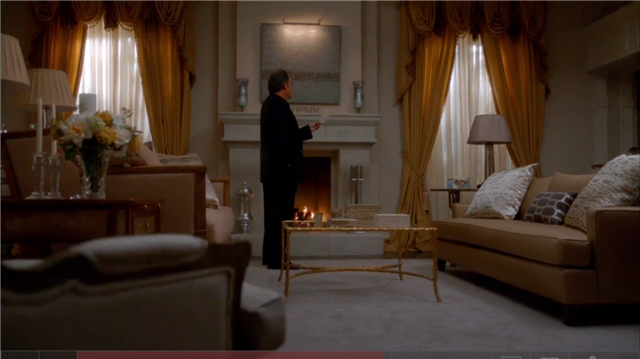 The Sewing Studio’s drapes play a role in one of the shows most dramatic scenes, when Marisol lights the ones in the Powell’s guest room on fire. The Sewing Studio, located at 5309 Peachtree Boulevard in Chamblee, regularly sews for movies and TV shows filmed here in Atlanta, including The Blind Side, Identity Thief, The Walking Dead and Vampire Diaries. In addition to sewing cushions, drapery and upholstery for use on set, The Sewing Studio also manufactures back-of-the-house pieces such as reflectors to redirect and filter lighting to sandbags for steadying equipment. The Sewing Studio not only sews for movies, TV and theater, but also for companies that want their products “Made in America.” The studio’s 10,000-square-foot shop houses more than 20 industrial-grade sewing machines, a spacious workroom, in-house design consultation and more.